Ah yes the monthly haul post. My monthly shame. Punctuated by some of my Instagram photos. My name is Rebecca and I am vulnerable around clearance sales. Oh boy. My favorite drugstores had some fantastic deals. They had the OPI James Bond magnetic sets for only FIVE DOLLARS each (regular $20+) and single polishes for $1.88!! Hold on, girl, is that an Essie set for $5?! Two polishes and a glass file?! Wait a second, Nicole by OPI for $3.99?! Well since I've gone this far... I might as well buy this one Maybelline that looks nice for $1.50. After this massive haul (that also included some other makeup which I won't post about to preserve what dignity I have left) I only bought a few more things this month at regular price. I hate regular price. And last but not least... SHOPPERS DRUGMART HAS NAILS INC?! Take my money. Just take it. My monthly hauls might have to start including makeup. Uhoh. I'm such a hoarder. Hey guys! Today I'll be showing you a new-to-the-market indie polish line called LAVlacquer! These polishes were my faves from the shop and the lovely Dij sent them all to me! And FYI, her polishes are currently being sold in the round bottle, not the square. First up I will show you my absolute faveeeee. Okay, aside from the fact that I keep singing that song from Miss Congeniality, I LOVE THIS. It is pink and purple and blue and sparkly and holo and great. The formula is lovely, needing three coats to cover but thin enough that it is not gloopy or lumpy. It seems to be made of small glitter and micro glitter in several colors. Perfect! If you're gonna get just one polish from this store, make it this one!! Another small glitter polish, but this time all holographic blue! It's so pretty and sparkly. I've done three coats for the coverage you see here - if you look closely you can see bald spots but that is only in macro photos! It appears totally opaque and wonderful in person. Good formula, no dragging or lumpiness, etc etc. Exact same as above - but purple!! Don't need to say anything else. Love it. As we are all aware, neon glitter is a huge polish trend right now! This one is full of bright yellow and hot pink hex glitter in several sizes, in a clear base. It requires no glitter-fishing and applies well. This one would also look really cool over black! This one is different from the previous polishes and has a milky pink base! There are dark purple, red, and very bright pink hexes in this polish, and it all combines for a really nice girly look. 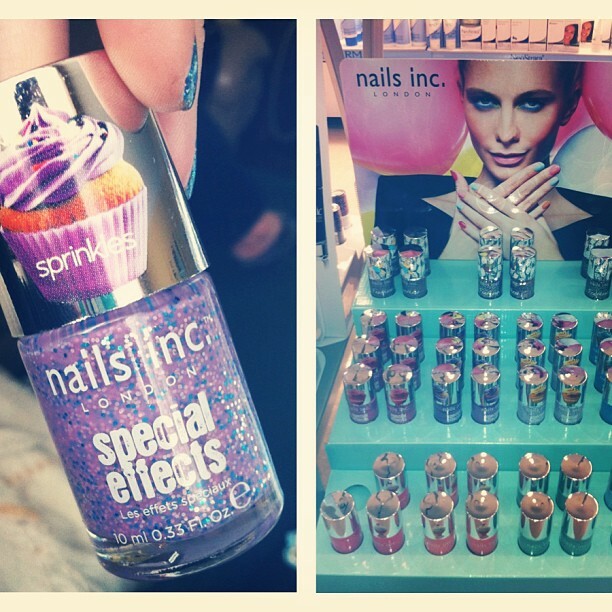 What do you think of these fun glitters? I can definitely see myself wearing those first three again and again! And I'll go as far as saying that One In A Million is one of my favorite indies that I own. Click here to go to the store where each full-size bottle retails for $8.75 USD and minis for $4.75. And don't forget to check them out on Facebook! The Maybellne Polka Dots collection is a trendy offering, trying to win the hearts of milky glitter lovers. I hadn't heard of the collection until I walked into a drugstore and saw the display. When I first saw the display, it was fully stocked... Except for one row of polishes. I said to myself, "Damn, I bet that one polish that already sold out was probably the best one!" Turns out, I was right. I found a full display in another store and realized the one I hadn't seen yet was PINK. Immediate impulse purchase. For some reason, I really can't decide if I want to write a good review or a bad review for this polish. I love the concept, love the look, but the polish is a different shade on the nail than in the bottle (less purpley - boo) and the formula is really difficult when you factor in the not-so-stellar brush. So... Like... I like it. But it could be better. I think the first photo was a fluke and makes it look a bit nicer than it actually is. The following two are more accurate I think. But I just wanted it to be more of a purple-toned color like the bottle shows and I would like the formula to be easier to work with. That being said - I still like it enough to consider picking up the green one if I stumble upon it. Have you picked up any of these Maybelline Polka Dots? This was actually the first Maybelline polish I tried since their rebranding! I'll definitely pick up more if they continue to come out with fun polishes like this one. I won't let my so-so review of this one turn me off. At least not yet... Haha! I love Winners. They provide me with multiple nail polishes at a reasonable price. I got this Essie Resort Collection 2013 cube for $14.99. I wasn't planning on picking up any of these colors at the usual Essie price, but hey, a cute cheap cube I can go for. I think this one is my favorite of the set - a spring green creme. Nice formula, I'm pretty sure this was just two coats, and it was opaque in person but I can see some streaks in the photos. It might be impossible to see in this photo if you aren't me... But it changes color a little when you add topcoat (or Seche Vite, at least.) It made it just a bit more yellow-toned and that annoyed me because I liked it more before it changed. Haha! Hehe, I love this name. Nothing special about the polish, just a nice lilac with the usual nice Essie formula. I love this bright sky blue. I did my nails in a major rush when I used this color, so my application isn't perfect, but that was my fault and not the formula. If you're being more civilized with your nail painting, you can do two easy coats. This is a hot red-coral that really pops. I don't think it really goes with any of the other colors in the collection - another pastel would have been more cohesive. But the color iself is pretty great! Nice and vibrant for summer. Great formula, practically a one-coater. Have any of my other Canadian ladies found Essie cubes at Winners? I'm hoping to find the Naughty Nauticals cube there too because holy crap I want that whooooole collection. And not at regular price! Haha! Holy crap, this week flew by and I didn't even notice. I thought it had been maybe three days since my last post... But it's been over a week!! CRAP. Today's post is yet another gradient leopard. I die for gradients with leopard prints. You probably already know that. Turquoise. Gradient. Leopard. China Glaze Sunsational Neons. It doesn't get much better. This is not a typical sponging-gradient, you just do this by adding layers of the very transparent jelly polishes to build up the color. Check out my last Sunsational-jelly-gradient here for a bit more detail if you need it. It started with a base of China Glaze - Too Yacht To Handle, the brightest blue. I deepened the tip of the gradient with some China Glaze - Isle See You Later, the blue jelly. Then I added dots with the light green, China Glaze - Highlight of My Summer, and used black to finish off the print. For some reason, my camera didn't want to really pick up the gradient. I think the colors are just too bright! Too Yacht To Handle in particular is like BAM and my camera is like NO. Here's the gradient before the leopard. Mmm, so beachy and summery. Hey guys! What's one type of polish I never get tired of? And now our trusty Walmart is carrying a great option for those of us B&W lovers. Hard Candy has recently revamped their polish line and holy crap is it awesome. There are so many fantastic colors and glitters and shimmers... Ah! And even better, Canadian Walmart stores are now carrying the polish! They definitely hit a home run with this rebranding. A+! I really love this mix of glitter, it covers well and you just need one coat and maybe a little fishing to make sure every nail has some big pieces. This is such a fun offering from an affordable brand. Here I layered it over China Glaze - Heat Index, so of course I needed to turn it into a jelly sandwich! Lovey lovey love. I just did this for fun while swatching my CG Sunsational neons, so I didn't actually wear it, but I definitely need to!